Campaign for runoffs of Haiti’s chaotic, flawed elections open amid doubts, questions. PORT-AU-PRINCE — As a politics-weary Haiti begins the final push toward next month’s presidential elections, many here doubt that the process would be free from the chaos, fraud and controversy that plagued the first-round of voting. Haitian officials have promised to make improvements ahead of the March 20 election, where former first lady Mirlande Manigat faces musician Michel “Sweet Micky’’ Martelly. Earlier this month, under heavy pressure from the international community to adopt a controversial Organization of American States report, Haitian elections officials upheld Martelly’s claims that he had finished in second place. 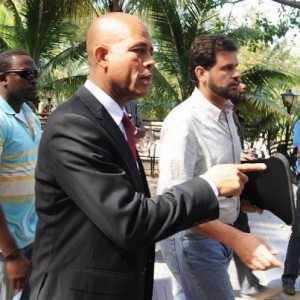 The decision reversed elections officials’ preliminary ruling that Martelly had been edged out by government-backed candidate Jude Celestin. But while the council requires a majority to proclaim the final results, only four of the eight members signed-off on them leaving the elections vulnerable to legal challenge, some contend. Still, some wonder whether salvaging the presidential elections without bringing the same kind of scrutiny to the legislative elections, which were also marred by irregularities and fraud, risks setting off a future crisis. Last week, both Manigat, 70, and Martelly, 50, officially launched their runoff campaigns. Among those who initially called for cancellation of the vote — they later reversed their positions after realizing they were leading in the polling — each expressed optimism about the runoffs but said they remain concerned about the integrity of the electoral process. The launches were as different as the candidates themselves whose agreement to avoid personal attacks quickly vanished as Martelly’s camp criticized Manigat’s age and lack of savvy about social media. Manigat’s camp fired back on the issue of immorality, citing Martelly’s penchant for dressing in a skirt and mooning fans when he performs. “We are practicing serious politics,’’ said Manigat, who launched her campaign with a news conference at the quake-destroyed Montana hotel. “I will lead a campaign and government that is serious, competent and open to everyone,’’ she said. Criticized for being more comfortable in French than Creole, and distant from Haiti’s poverty-stricken masses, Manigat used the first days of her campaign to answer her detractors. While she responded to the foreign press in English and Spanish at the news conference, she announced to the Haitians press that she would speak in Creole. One day later, she picked a popular slum neighborhood, once a stronghold of former President Jean-Bertrand Aristide, for her first rally. Hours earlier, about 4,000 Aristide supporters marched in the area to “welcome’’ his return from exile in South Africa, and threatened to disrupt the runoffs if he’s blocked from entering Haiti. “I know your problems. I know your pain. I am a mother,’’ Manigat told the crowd, adding that she was ready to “wear iron underwear’’ to battle for their interests. Hundreds of miles north, thousands gathered in Cap-Haitien to hear Martelly. The rallies took on a carnival-like atmosphere as a pink-clad Martelly spoke of national production, education and the importance of family. In between, he offered updated tweets to his 7,189 Twitter followers and posted photos on Facebook. At his side throughout was Haitian-born hip hop artist Wyclef Jean, whose coveted endorsement was announced a day earlier. Observers say it will help solidify Martelly’s appeal among Haiti’s large young population. But whether either candidate can excite Haitian voters enough to win with a popular mandate was unclear. “These elections are far from perfect,’’ said Carlos Westendorp, former foreign affairs minister of Spain who now serves as secretary general of the Club of Madrid. The forum of former world leaders visited Haiti last week to meet with both candidates, elections officials, business leaders and President René Préval on the upcoming vote. Whomever is elected president will inherit a situation in which charity is more common than jobs, recovery and reconstruction from the earthquake have been moving at a snail’s place, and a deadly cholera epidemic is killing thousands of Haitians, especially in remote areas inaccessible by roads. Then there is the overwhelming power of the international community, which is not just picking up most of the $30-plus million election tab but has pledged more than $10 billion over 10 years in quake-rebuilding support. Fatton worries that despite the elections’ historic nature, Haiti could find itself with an election marked by even lower turnout than the 1 million who voted in the first round.